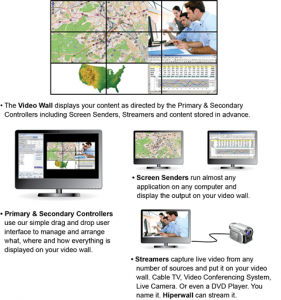 PTS has reached Premier Gold Reseller status with video wall manufacturer Hiperwall. Hiperwall is an innovative video wall and distributed visualization system manufacturer that lets you see the big picture in a brand new way. They make a powerful video wall system that is software versus hardware driven, providing unmatched speed, flexibility and functionality in extremely high resolution. Contact PTS to discuss your video wall system options, or visit our Audio/Visual Solutions site to review complete A/V solutions for your enterprise.